Verlagsbeschrieb: "Scholars have long puzzled over the distinctive themes and sequence of John's narrative in contrast to the Synoptic Gospels. Brian Neil Peterson now offers a remarkable explanation for some of the most unusual features of John, including the early placement of Jesus 'cleansing' of the temple, the emphasis on 'signs' confirming Jesus' identity, the prominence of Jesus 'I Am' sayings, and a number of others. The Fourth Evangelist relied on models, motifs, and even the macrostructure of the Book of Ezekiel." Verlagsbeschrieb: "Especially those scholars with a negative attitude towards Johannine authenticity have frequently employed the argument based on vast differences between John and the Synoptics as to substantiate their view. Having established the methodological necessity for a clear differentiation between similarity in wording and similarity in content, the study's main result is that what we find in the Johannine discourses is a representation of the teaching of Jesus that corresponds conceptually to a significant degree with the picture offered by Matthew, Mark, and Luke, though couched in a very different idiom. Indeed, other historical questions need to be answered in order todemonstrate positively the historical reliability of Jesus' words in the Fourth Gospel. However, detailed comparisons between the teaching of Jesus in the Synoptics and Jesus' words in John show that to deny the possible authenticity of the Johannine discourses based upon analleged incoherence with Jesus' teaching in the Synoptic Gospels is unjustified in light of the evidence." Umschlagtext: "Das Johannes-Evangelium nennt eine Wirkungsstätte von Johannes dem Täufer 'Bethanien jenseits des Jordan' (Joh 1,28). Seit früher Zeit wird bei Jericho die Stelle gezeigt, an der Jesus getauft wurde. Neue Ausgrabungen am jordanischen Ostufer des Jordan haben diese Ortsüberlieferung bekräftigt. Aber die traditionelle Taufstelle und 'Bethanien jenseits des Jordan' sind nicht gleichzusetzen. Schon den Kirchenvater Origenes (185-254 n.Chr.) hat das Rätsel dieses Ortsnamens beschäftigt (und nach ihm viele Forscher). Die beste Lösung ist, in 'Bethanien jenseits des Jordan' die Landschaft Batanäa zu sehen, die nordöstlich des Sees Genezareth liegt. Am alttestamentlichen Baschan haftete die Erinnerung an grosse Siege des Volkes Israel. Deshalb erwarteten manche fromme Juden das Auftreten des Messias im Norden. Auch Johannes der Täufer und Jesus haben in der Batanäa gewirkt. So ergeben sich von der Topographie her nicht nur neue Einsichten in die Geschichte der johanneischen Gemeinden, sondern auch zur Entstehung und Theologie des Vierten Evangeliums." "Throughout much of the twentieth century the Fourth Gospel took a back seat to the Synoptics when it came to historical reliability. 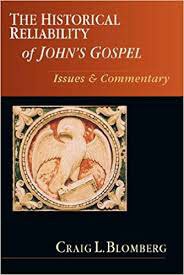 Consequently, the contemporary quest of the historical Jesus discounted or excluded evidence from the Fourth Gospel. In his commentary examining the text of the Fourth Gospel, Blomberg asks two essential questions. First, using the recently nuanced criteria of authenticity, "What positive evidence do we have that the actions or words of the characters in John's narratives are indeed historical?" Second, "Is there anything in the text . . . that is implausible within the historical context to which it is attributed, particularly if we assume the general historical trustworthiness of the Synoptics?" The result is a seminal work for the present day--one that affirms the historical reliability of John's Gospel with intelligence and sure-footed care." "By means of careful historical work and exegesis, Streett argues that the secession mentioned in 1 John did not have to do with a later complex Christological issue such as docetism, Cerinthianism, or a devaluation of the historical life/death of Jesus, but rather concerned the foundational belief in the Messiahship of Jesus, a tenet the secessionists had renounced in order to return to the Jewish synagogue. He critiques the common maximalistic mirror-reading approach to the letter as misguided, and contends that the letter is primarily pastoral, meant to comfort and reassure the community rather than to argue against the secessionists. Streett’s main contributions are his detailed examination of the ancient historical evidence (especially the Patristic evidence) for the Johannine opponents, and his in-depth and innovative exegesis of the key opponent passages (1 Jn 2:18–27; 4:1–6; 5:6–12; 2 Jn 4–11)."